Redwood Dec 2016 text - Website of kennetaccordionorchestra! Redwood House, Hungerford, Christmas Concert. Monday 19th. December 2016 saw the Orchestra returning to Redwood Residential Home Hungerford, for a Christmas Concert. There was a very festive party atmosphere with people enjoying a variety of Christmas music and Carols. The audience participated in singing and dancing throughout the evening. 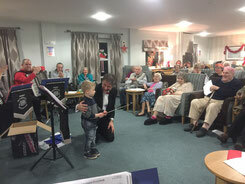 We even had a guest conductor helping Nigel......... 3yr. old Sebastian!